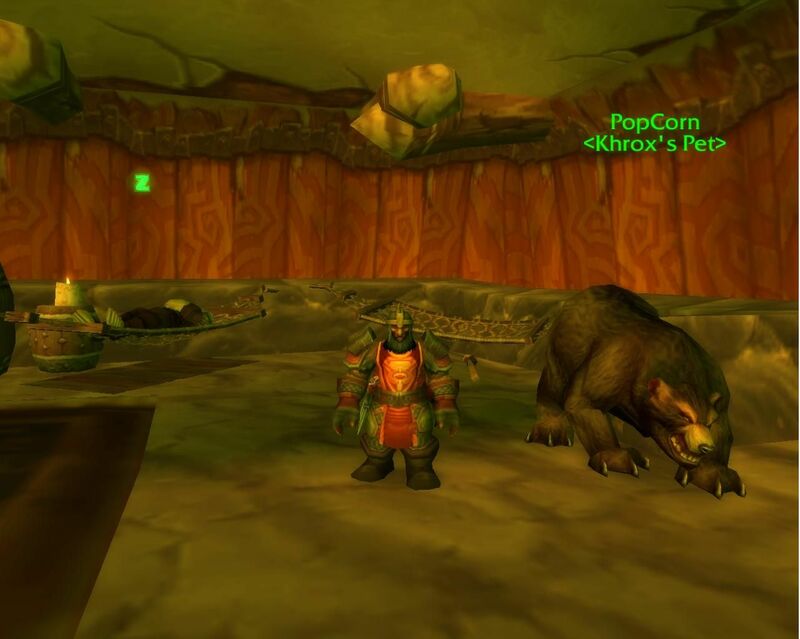 Moonkin Journeys: Khrox, the BeastMaster! I'm going to take a few moments here to talk about Khrox. Why, you wonder? He's just another alt from a long history of alts. Well, there is a slight differance. Khrox is a Dwarf Hunter, specced into beast mastery. Simply because I have this undeniable urge to collect rare and exotic pets, his sole reason for existance. The plan is just as simple. 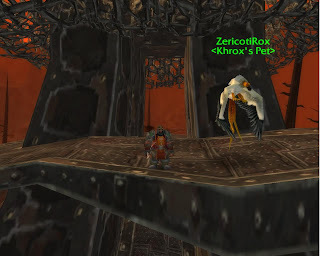 Tame a rare, exotic or unusual pet from every zone he quests in. And he is throughly questing his way through each zone in his leveling chain. In this manner, each zone is fully explored, and the required number of quests for loremaster are completed in unison. Not to mention that running all those quests provides ample time to come across those rare spawns. Khrox is just as layed back in nature. He likes keeping life basic. Explore, quest, hunt, skin, fish and cook. And let us not forget the after dinner ale or brew as we lay back and star gaze. He spends his evenings by the campfire cooking up a fresh kill or catch, sharing stories of the days adventures with his bear, Popcorn. Questing has been good to him. Already at a tender middle age of 50, and with the Easter Kingdoms at his fingertips. He has made a sufficient amount of gold along the way just by selling off all the cloth he steals from his kills, along with the occassional level appropriate and useful BoE weapons. With skinning as his only profession (primary), he has quite the stockpile of various leathers in the bank. Life with Popcorn began at age 1. Just a wee bit of a cub he was, barely tall enough to reach my knee. As we made our way through Dun Morogh and Loch Modan, he grew quickly in both size and strength. His rather strange behavior began about the time we were departing from the homeland for the Loch. Every so often after a kill, Popcorn would crazy run off after some small creature or bug. It was kinda cute in the beginning. I figured that he was just fired up from the kill and got anixous for the next. By the time we entered the Wetlands though, his little crazy-ness began to cross the border into being slightly insane. He'd run off some 40, 50 yards or so just to kill off a marsh bug, and return with a couple of baddies he aggro'd long the way. We made our way through those Arathi Highlands, into the Hinterlands, on to the Plaguelands and rocketed down to the Badlands. All the while, Popcorn kept straying off further and further for some insane senseless kill, and bringing back more creatures or baddies each time. I remember, in the Eastern Plaguelands we had to go through this cave with some rather over-grown spiders, stepping on all their newly hatched young in the process. Now, two and three of those crazy spiders, no problem. Then that insane bear of mine decides to clear out all the spider babies, in several tunnels! He came back with 7 of the meanest, largest, pissed off spiders to show for his galavanting. I put up one heck of a fight that day, took down four of them before there was no place else to go. It was a bitter death I tell ya'. Bitter I say, cause that insane bear lived through it! Well then, there's no hope for Popcorn. He's completely insane and un-manageable now. And nearly twice as tall, wide and long as me. But what a brute. We can jump into the middle of a twilight or dark iron camp and clear out 7 to 10 of 'em now, no problems. As for his wacky jaunts, well, I just sit back, sip a brew and watch for his return. Take aim and fire one off on the first thing close enough to hit. With luck, ol' Popcorn will turn on his heels and stop the pack before it gets to me now. Nix, a rare wasp from Loch Modan. Now called NixRox. Kind of a shame creatures shrink once tamed, but I suppose it's for the good of the overall plan of things. Nix was rather large and colorful. From the Wetlands came a package deal. The Razormaw Matriarch. Now called RazormawRox. I also looted through her nest and came up with one of her hatchlings for a companion. The three of us looked quite merry skipping through the rest of the Wetlands. The Hinterlands brung to the family Gammerita, a giant quest turtle. Well, someone else's quest turtle. Those tree-huggin Night Elfs I think. She is now known as GammeritaRox. I may return to the Hinters some time just to see if 'ol Cliff Jumper' is still around. 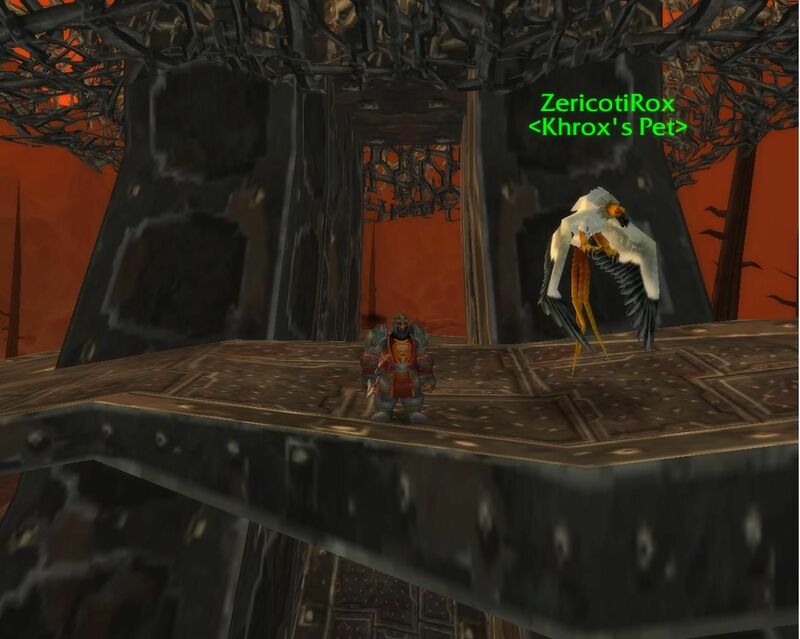 "Zaricotl seems to feel much better now that it has eaten the remains of Khrox." Needless to say, when I later became 48, Zaricotl became ZaricotiRox. Right then and there. And yes, I got my i's and l's fingers mixed up at the time. Searing Gorge: Here we finally found Rekk'tilac, a rather overgrown lava spider. Nothing really special about this spawn, and for the next three levels after taming, he ate constantly. So he sits on-call patiently while Popcorn again adventures forth. On the agenda, a couple of zones still un-decided, although quested: *Western Plaguelands: ? ?, *Eastern Plaguelands: ? ?, and the *Burning Steppes: ?? Questing these areas began to require much more focus on the mobs, and there were no obvious rares sighted while doing so. I'll have to research for possibilities and back track a bit for them. Khroz, now 53, is currently in the Swamp of Sorrows with the Blasted Lands following. That about sums up this wall of text and Khroxs' adventures thus far. Now, I'm pretty sure I'm not the only one who rolled a hunter just for the sake of collecting rare pets. Or for that matter, any other class rolled for some obscure reason. Care to share your secret indulgence here? It's okay. Really. Enjoy the screenies. Have fun, we'll see 'ya next time around!